Residents of La Belle Province should expect to pay more for online purchases starting next year. 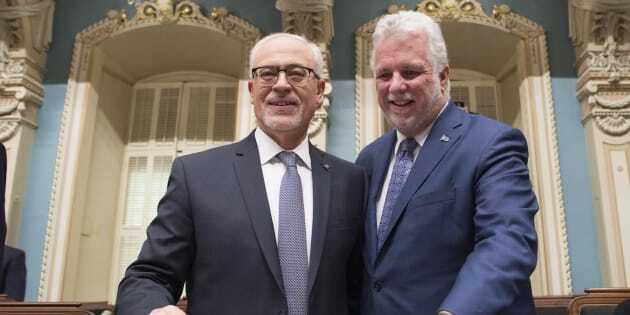 Quebec Finance Minister Carlos Leitao is joined by Premier Philippe Couillard, as he arrives to table his budget on March 27, 2018 at the National Assembly in Quebec City. The budget includes a measure to tax Netflix and other foreign online businesses. Quebec has made good on a vow to charge provincial sales tax on Netflix and other foreign online businesses that have customers in the province. As part of its latest budget, unveiled Tuesday, the provincial government said it will require foreign online services to register with the province as of January 1 of next year, and start collecting the 9.975-per cent provincial sales tax. The tax will apply to sales at Amazon, Netflix, Spotify, iTunes and other online services that operate from outside Quebec. Online companies without a major presence in Quebec will be exempt from collecting the tax until Sept. 1, 2019. The law will only apply to companies that collect more than $30,000 in revenue from Quebecers. The move comes in response to the federal government's decision last year not to tax U.S.-based Netflix, and to exempt it from Canadian content rules in exchange for a commitment from Netflix that it will invest $500 million into Canadian programming. That deal met with considerable opposition in Quebec, in large part due to the fact Netflix didn't commit to creating French-language content. Quebec's Liberal government urged their federal counterparts to reconsider the deal, arguing that not charging sales tax on foreign sellers would put domestic businesses at a disadvantage. In Quebec, for instance, Netflix faces competition from Videotron's Illico streaming service, as well as from Bell's national CraveTV streaming platform, which collect sales taxes. The province loses $270 million annually by not collecting taxes from online sales, and a majority of that — $158 million — comes from the sale of clothes and shoes, provincial Finance Minister Carlos Leitao said, as quoted at Bloomberg. The province's latest budget lands seven months before the scheduled provincial election in October. Projected surplus of $904 million on total revenue of $109.6 billion, including $23.7 billion in federal transfers. The surplus will go to a fund aimed at lowering the province's debt. Estimated gross debt of $204.5 billion as of March 31, 2018. That represents 49.6 per cent of gross domestic product, down from the peak of 54.3 per cent in 2014-15. Expected economic growth of 2.1 per cent in 2018 and 1.7 per cent in 2019. Increase of 4.6 per cent in health spending — an area in which the opposition parties will target the Liberals before and during this fall's election campaign. Investment of $500 million by 2022-23 to modernize the province's justice system, partly aimed at ensuring no proceedings are stayed because of unreasonable delays. An additional $65 million in tax credits by 2022-23 to support the digital transformation of print media companies. Free visits to museums one Sunday a month in a measure that is expected to cost $5 million.